Frequently Asked Questions about our latest new opportunity for Pitt innovators. What is the Performance Innovation Tournament? 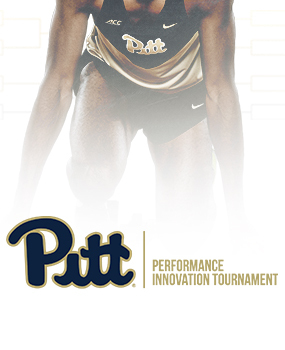 The Performance Innovation Tournament is a collaboration between the Pitt Athletics, the Innovation Institute, the Clinical Translational Science Institute (CTSI), the Office of the Provost and the Office of the Vice Chancellor for Research. It was established to encourage collaboration among Pitt researchers and the Athletics Department for the purpose of driving innovation in human performance. A way to measure Heart Rate during practice and display on a monitor. Current issues: Heart rate straps move too easily and other devices interfere with the activity of the swimmer, such as wrist monitors. We would like to monitor heart rate and recovery in the way that dryland running sports can in real-time and display on a monitor outside of the pool. Current issues: current tools are mounted to pool walls and are permanent. They are large devices that take up too much space. We would like portable, light, and removable equipment. Current issue: Devices available today are not usable in team settings. We would like something that may attach to the hand or other area to show acceleration, spead, watage, etc. and be displayed on a monitor. Current issues: There is no way to currently measure mental strength and understand how individuals will perform under stress. We would like a way to predict, in a straight-forward manner a person’s ability to perform under high pressure situations. Solutions can be biological, physical or psychological. Current issues: Existing devices measure number of jumps (“Vert”), but do not include accelerometer, GPS, etc. to measure total mechanical/physiological load on an athlete. Current issues: There is no way to measure forces/angles in a way that does not interfere with activity. It would be ideal to have a sensor that can be stitched into knee pads that measure forces and angles of knees upon jumping and landing. Current Issues: there are no reliable and practical ways to measure rotational power. We would like a solution that can asees this in a unobstrusive manner. Current issue: Athletics coaches and trainers have access to a large data set produced from the multiple wearables and equipment their athletes are using. The difficulty is in analyzing and interpreting the data in a meaningful way. The question posed is how might innovative data analytics and conventional mobile computing platforms be used to assess and present athlete data to coaches and trainers in simple and useful ways? The above are examples. Other solutions that improve athletic or human performance will be considered. What types of solutions will be considered? Pharmaceutical innovations are NOT in the scope of this program. Full or part-time faculty and students are eligible to apply, however, applicants must have the support of a full-time principal investigator. The funds will be awarded to a Pitt faculty department and will be evaluated as potential Pitt intellectual property. Abstract of no more than 500 words that summarizes the innovation, explains its relevancy to the proposed problem or area of interest, and outlines a plan for prototype development and validation testing of the innovation in a practical, real-world setting among Pitt athletes (availability may vary across athletic discipline and will need to be arranged with the appropriate individuals). Proposals that emphasize efficient and economical use of student-athlete time will be prioritized. Budget and justification covering all costs of the project including (where applicable) salaries and wages, equipment, supplies, other/misc. What is the application review process? Proposals must be the original work of the proposer and will be subject to review by the Innovation Institute, CTSI and the Athletics Department. All entries will initially be reviewed based on potential of the innovation to solve a real-world problem within the scope of the areas of interest, the feasibility of developing a useful prototype and the testing plan. Based on the application submission, semifinalists will be chosen by a selection committee and notified by the week of March 19, 2018 at which time they will be invited to participate in the Finals “pitch tournament” on April 11, 2018. At the pitch tournament, each semifinalist will be required to make a 30 second “elevator pitch” (without slides) followed by 2 minutes of Q&A. Judges will select the top 4 from round 1. For round 2, 4 semifinalists will do a 2 minute pitch presentation (with slides if desired) followed by 3 minutes of Q&A, of which the judges will choose 2 finalists. The two remaining semifinalists will do a 7 minute pitch presentation (with slides) followed by 7 minutes of Q&A and compete for two top awards of $80,000 and $70,000. What are the finalists awarded? The 1st place entry will be awarded $80,000, a trophy and 4 Pitt football season tickets. The 2nd place entry will recive $70,000. Financial awards will be transferred to the Pitt department of the lead or sponsor principal investigator. Both finalists will be announced as the Founding Innovators of the Performance Innovation Tournament. When is the award period? The award period begins May 1, 2018, and runs through December 31, 2018. Awardees understand the award is to be used within the University for reducing the innovation to practice, prototype development and technology validation activities. The award funds will be transferred to a University account designated by awardee. Award funds must be expended in accordance with University policy. If you are interested in having a representative from the Innovation Institute come to your department to explain the tournament, please contact Jennifer Ireland at jireland@innovation.pitt.edu.